Having for years lingered in the fringes of economics as its carnival attraction (which, considering the recent track record of the dismal science isn't saying much), MMT, aka Modern Monetary Theory, aka the "Magic Money Tree", aka "The Free Lunch theory of economics" has exploded on the scene as politicians on the left saw it as a perfect platform upon which to build virtually unlimited promises in hopes of getting elected (see the Green New Deal). 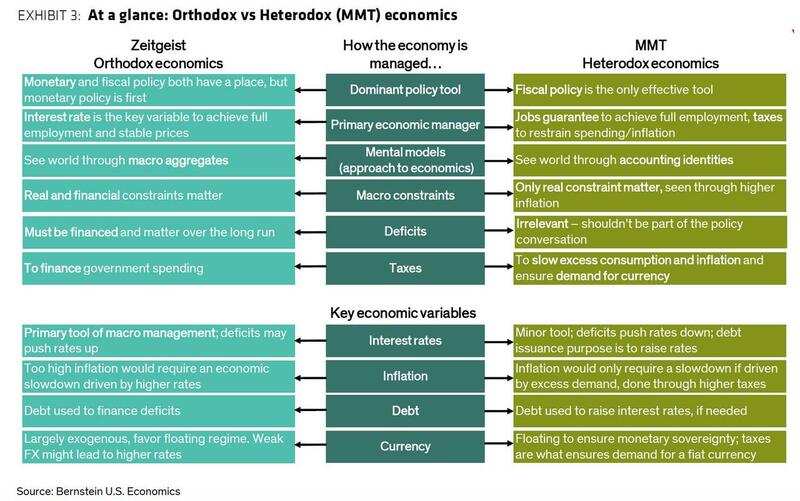 In fact, interest in MMT has swept not only across the broader population but increasingly the world's top legacy institutions, such as the IMF, with none other than the IMF's chief economist addressing the disciples of the theory on Tuesday, warning not to expect a free lunch. "Fiscal policy is a very important part of the tool kit for policy makers,” Gita Gopinath told reporters at a press conference Tuesday in Washington, following the IMF's release of its latest, and weakest since the financial crisis, global economic outlook. "That said, there is no free lunch. There are limits to how much countries can spend." Incidentally she is not the first to use "free lunch" to describe the fundamental fallacies in the theory who core doctrines are summarized in the chart below. Over the past week, some of the best known Wall Street strategists have also opined on MMT, starting with Goldman's chief economist, Jan Hatzius, who in a Monday paper said that, without endorsing MMT in its entirety, said that "we think its proponents make a couple of points that are both correct and important." One of them, he said, is that countries like the U.S. and Japan can’t go broke because they print their own money. No, they can't: they can just end up as hyperinflationary basket cases such as Weimar, Zimbabwe and Venezuela, all of which imploded under the weight of their own currency... literally, as at one point it took several wheelbarrows to purchase a roll of toilet paper in Caracas. Confirming that even conventional economists are completely cluless, Hatzius then said that in recent decades, it’s been buildups of corporate or household debt rather than public borrowing that triggered financial crises, echoing an MMT argument that when governments run deficits, they’re typically allowing private actors to accumulate assets. "We are therefore more reassured by the U.S. private sector surplus than we are concerned by the public sector deficit," Hatzius said, while completely ignoring that when governments are the ones doing the spending, the fall outs are even worse, and include a collapse in productivity, widespread corruption and, of course, socialism. Goldman aside - whose bizarre quasi-infatuation with MMT may be a harbinger that helicopter money is on its way with the benefit of Goldman's seal of approval, a far more accurate, and comprehensive criticism of MMT came Bank of America Merrill Lynch’s head of global economic research, Ethan Harris, who also acknowledged the case for MMT-type policies "during a period of severely depressed demand", i.e. QE, but far more on point, he also said that applied more broadly, the theory amounts to a recipe for hyperinflation. In previewing his takedown of MMT, Harris writes that one of the striking things about the recent economic policy debate is the proliferation of "free lunch" views of monetary and fiscal policy, and - as a conventional economist - Harris pushes back "against left-leaning" free lunch arguments, noting that "the rising popularity of free lunch narratives makes it very hard to address the budget deficit and suggests rising political pressure on the Fed. In other words, despite all the angst about recession risks the bigger risk in the next few years could be an overheating economy and rising bond yields." Said otherwise, to those who believe the world will end in fire, i.e. hyperinflation, not in ice - to loosely paraphrase Robert Frost - and are buying up gold hand over fist just for that eventuality, then MMT, and Fed Chair Alexandra-Ocasio Jones, is just what the doctor ordered. Below we present the key points from Harris' criticism of MMT, which he dubs "money for nothin', checks for free." Until recently Modern Monetary Theory (MMT) had a relatively narrow audience, but more recently it has attracted political attention because it can be used as a justification for money-financed deficit spending. As with many economic theories, it has some important truths that are stretched when they enter the political realm. The literature is quite diverse, but we would boil it down as follows. The starting point is a simple fact: if a country controls its own currency it can always pay its bills by issuing new money. Does that mean no limits on spending or money growth? No, if the money-financed government deficit starts to create inflation, then the money can be sopped up by either cutting spending or raising taxes. In the MMT world money growth does not directly cause inflation. Rather inflation is caused by a combination of monopoly power in the economy and the economy hitting "full employment. "(*) Moreover, drawing on Keynes, MMTers believe that the economy typically suffers from insufficient demand, thus the inflation threshold will only be reached once the government is running significant deficits. The Fed's job in all of this is to keep interest rates low and stable and leave it to fiscal authorities to prevent inflation. Indeed, by some accounts, the "natural rate of interest" on money should be zero. Perhaps the most important take away from this is that, in theory at least, MMT can be used to justify both big tax cuts and big spending increases. In practice, however, Harris counters that given the strong Keynesian component of the theory "it has been mainly used to justify the latter." First the good news. During a period of severely depressed demand and zero policy rates, money-financed deficits make a lot of sense. Indeed, this is essentially what the US did in response to the Great Recession, combining large budget deficits with large Quantitative Easing (QE) programs. Critics argued that this "debasing the currency" could trigger runaway inflation. (*) We strongly disagreed: QE was a way to add a small extra kick to monetary policy, helping stimulate sectors that are sensitive to long-term interest rates. In our view, currency debasement was a red herring as long as the Fed and other central banks had a credible commitment to their inflation targets. Now the bad news. As you would imagine: a theory that argues for both zero interest rates and large budget deficits seems a bit too good to be true. Consider the current Fed exit from zero rates and a big balance sheet. As the economy recovers and inflation forces start to build, zero interest rates and an ever expanding balance sheet no longer were appropriate. Had the Fed been under political control and refused tighten monetary policy, today we would be experiencing a massive overheating of the economy. MMTers would argue: "don't worry politicians will do the dirty work of containing inflation." Really? If the Fed wants to contain inflation, it must either stop flooding the economy with reserves or pay interest on reserves so that banks will be willing to hold them. One way or another, the government has to pay interest on its debt. In other words, the free lunch thinking on MMT only applies when the economy is deeply depressed. There are, to Harris, several other problems with MMT, the first of which is history showing that "full employment" is not a zero unemployment rate: "
As the Great Inflation of the 1970s illustrates, pushing the unemployment rate below its non-zero "natural" rate can cause a massive inflation acceleration. Second, it is wishful thinking to believe that fiscal authorities have either the will or the ability to control inflation. Looking ahead, with the US economy at full employment now is not the time to add even more fuel to the fire." Imagine how ossified the labor market would become if the government created enough good-paying jobs to lower the U-6 to zero? There would be a dramatic drop in incentives to retrain or move to more vibrant parts of the country. There is a trade-off between economic efficiency and cushioning the blow of unemployment. For anyone who wants to see this in practice, just take a flight to Caracas. "With both sides of the political spectrum touting free lunch theories, it is hard to see a serious attempt to reduce the budget deficit any time soon. Over the long term this points to higher borrowing costs. Meanwhile, political pressure on the Fed to stop fighting "phantom inflation" will grow and could become more bi-partisan like in the 1980s when Chair Volcker declared war on double-digit inflation." The upshot to all this idiocy, which was started with QE, which many see, correctly, as socialism for the 1%, and now demand socialism for the 99%, is that despite all the talk about recession risk, serious overheating and higher bond yields could be the bigger risk in the next couple years. What this means practically? Should MMT gain even more traction - and it will as most democrats plans to use it as their platform in order to promise virtually everything voters could ever want - then buy gold... lots of gold.